Focus Energy is not all that reliable, and requires luck, but with scope lens, this gives a pretty good chance for you to score a critical hit. This set with the help of luck can turn out to be very successful. Although not as successful as the other sets. Hidden Power electric is especially for Gyarados, Empoleon, although is also for any other water type. Ice beam provides more coverage then dragon pulse, but a stabbed critical is nice to have. 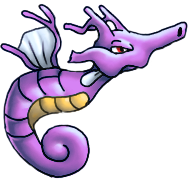 Surf/Hydro Pump would be your main attack, as it’s the biggest stabbed attack available for kingdra. This set can have a lot of payoff, but just as the preveous set it still requires some luck. A critical hit from Draco Meteor with sniper can has the potential to even 1 hit KO Blissey, that’s beastly. Hydro Pump has the potential to 1 hit KO Blissey as well, but its not guaranteed unlike Draco Meteor. Dragon Pulse is for late sweeping, although Ice beam is preferred for more coverage. And Hidden Power electric is there for Empoleon, and Gyarados. This set can cause quite an uproar. After a Dragon Dance Kingdra reaches 403.5, which ties with Scarfed Heracross, but is nice because surpases the 394 speed tier. Waterfall is the main stab attack here, Return is for water types, and vaporeon. Substitute can be used to block status, or to even get an extra DD in, although Draco Meteor and Hydro Pump can be of help aswell. Scope Lens with Sniper and a Dragon Dance can cause quite an uproar if luck is on your side. Mixed Kingdra is one of the most effective sets Kingdra has to offer, reason being is it has the ability to hit from both sides. With Rain Dance in play Kingdra can 2ko blissey with waterfall, therefore lum berry is offered go give Kingdra some temporary status protection. Surf or Hydro Pump is for physical walls instead of special, and Draco Meteor can be used to hit for massive damage aswell. The good thing is after the special attack drop you can switch to waterfall and continue to sweep. After rain dance kingdra can even surpass scarfed garchomp. This set has a lot of potential. Although not as effective as the previous set, this set also has sweeping potential. Although not as much as it can have trouble against special walls. Make sure to annihilate the opponents special wall before bringing this in. HP elec is for gyrados, empleon and other water types. Surf is stab, as well as Draco and coverage is pretty much self explanatory. Ice beam is there if Dracos Special attack drop bothers you. Kingdra gets not other really good moves besides Yawn, Flail, and Signal beam. Yawn can be used for phasing and/or racking up stealth rock damage. Signal beam can hit celebi, but is pretty much useless otherwise. And flail gets walled pretty easily, and with hippowdon and tyranitar everywhere this set will not be effective. Kingdra doesn’t have a big move pool, but with luck and ability Kingdra is a very decent option for a sweeper on a team. The best way of countering Kindra is by finding out what type it is. Most sets get walled by Empoleon without Hidden Power Electric. Special Sets get walled by Blissey/Snorlax and/or any other big special wall, although Sniper Sets can be a pain. And Dragon Dancing sets can be walled by physical walls, providing a critical hit doesn’t present itself.